Longer than the standard 8.5mm bolts provided with SPD-SL cleats. 10mm length is needed for proper installation with shims or certain shoe models. 6 per set. Slightly longer 13.5mm bolts are also available. I just bought a new pair of the Sidi Women's Genius Fit Road Shoes and these bolts work great to affix my Look style (Shimano SPD-SL) cleats to my new shoes, as they are longer than the standard bolts. I'm satisfied! When I purchased some SIDI biking shoes the 10 mm bolts were recommended. So far no problems they are working Great. provides the added length to firmly secure cleats to SIDI road shoes and not strip out insertion threads. 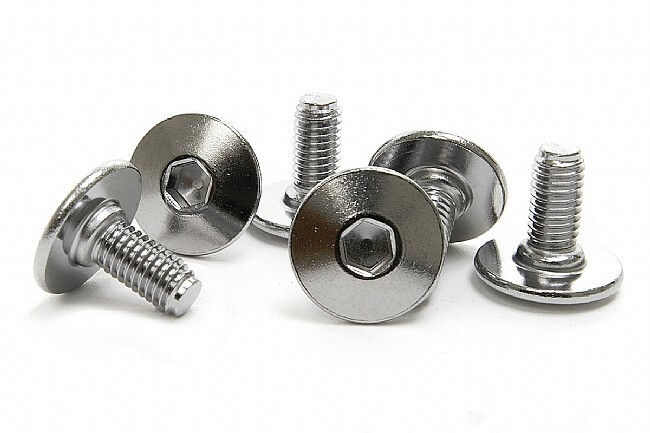 Bolts(10mm) replace standard bolts that come with the Shimano cleats. I had just gotten my first pair of Sidi bicycling shoes (the Genius 5, for what it's worth), when to my great and utter surprise, the bolts that came with the shoes were not long enough to connect the Shimano SPD-Sl cleats I also bought. At first, it seemed a cruel joke that a mere set of bolts would prevent my first foray into clip-in pedaling. But these little chrome plated beauties rescued the day. I eagerly tore into the package once it arrived and connected the cleats to my shoes. They firmly and securely attach the deeper Shimao cleat to the Sidi shoe. I have been riding regularly now with the clip-in pedals and will not go back. I don't know if these are absolutely necessary, but they do work well. And they don't stick up through the shoe insole. Having a couple extra threads in these bolts means you don't have to torque them too tight and risk striping threads or moving cleats. These are, at the very least, nice insurance and I would buy them again to go with my Sidi shoes. This is the correct bolt for certain specific SIDI shoes perhaps some other brands, too. This is the correct bolt size to use if you have SIDI shoes with either the Carbon Composite sole or the Millenium 3 sole. The regular 8 mm bolts that come with the Shimano SPD-SL cleats are the correct length for the SIDI shoes that have the Vent Carbon sole or the Carbon Lite sole. This is the right length for my Sidi shoes. Cleat screws come in different lengths. Different models of Sidi shoes require different lengths. Do your homework and get the right length. If you are going on a multiple day ride away from home, some spare cleat bolts can come in very handy. I learned this from experience. At times you will get shoes that have the cleat mount positioned lower than normal and you need a slightly longer bolt to reach it. These bolts will save the day in those cases. There is also a 13.5 mm length of you have a shim between the cleat and the sole, or if the mount is even lower. I wish that we wouldn't have to get special bolts for the Sidis but it sure beats stripping the threads. Cleats are secure and the wheels are spinning! These were recommended for my Sidi shoes instead of the 8mm. Worked great with no problems. I hated that the bolts that come with the Shimano SPD-SL cleats were not long enough for the Garneau shoes that I bought. These did the trick. the 10mm cleats are necessary if you use shims at all with the thicker sole shoes. I purchased for use the the Sidi Genius shoe - the std 6mm would be short while the 10mm worked allowing enough threads for a good grip. Once I got the cleats set I added a drop of blue loctite to keep them from coming loose. Bought these (as recommended by BikTiresDirect) to go with the Sidi Five Mega shoes I purchased and experienced no problems during installion of my Shimano SPD-SL cleats or on numerous rides. Good advice to buy when purchasing the Sidi shoes. Shimano SPD-SL cleats & Sidi shoes. Original bolts too short. These are what you need. Be sure to not get the longer ones as they will make bumps is the footbed and you'll notice them eventually. The 10mm work perfectly for me. Really like the allen head too.